of society—marginalized, perhaps even demonized, and disempowered. The full truth about what happened to them and how it continues to affect their lives is erased or denied—not only by the state, local authorities, and the national elite, but often even by those in their own communities and families. In 2016 and 2017, AJAR in collaboration with local partners conducted participative research with 31 women as part of our ongoing efforts to break the silence and amplify the voices of women survivors in Myanmar. We explored how women experience conflict and state violence, and in its aftermath struggle to survive in a system where impunity is the norm. Our research provides key lessons on how these women have helped themselves, while largely remaining invisible to those providing aid in conflict and post-conflict settings. In the rush to create peace, authorities want victims of war and repression to vanish and magically transform themselves into ordinary citizens without any specialized support. Marginalized from peace process discussions, women are unable to adequately voice their needs. 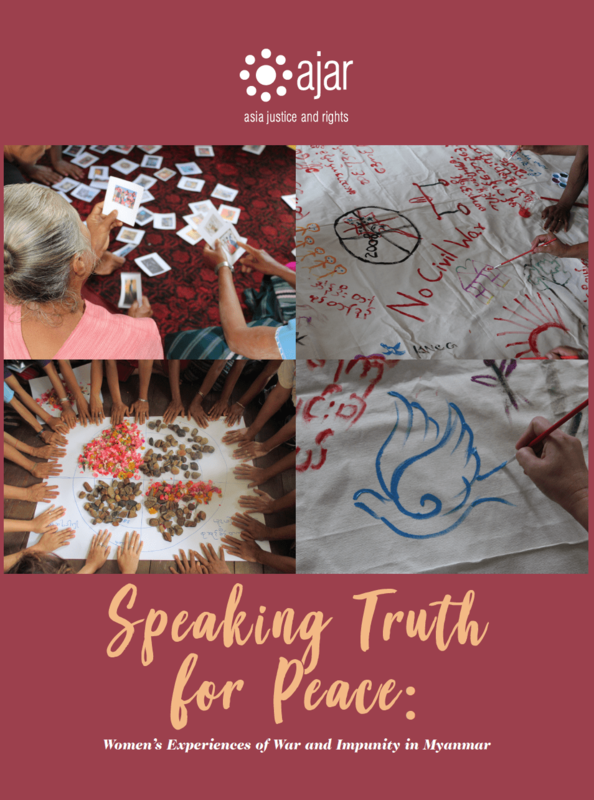 “Speaking Truth for Peace: Women’s Experiences of War and Impunity in Myanmar” captures the stories of 31 women from Myanmar—former political prisoners from Yangon, Ta’ang women who live in the conflict zones of Northern Shan State, Karen women village heads, and land rights activists. The report presents the key findings of AJAR’s research, outlines AJAR’s participatory research approach, and provides a list of recommendations for addressing truth, justice, and reparations for the women survivors of Myanmar.